Don’t Pick at It, You’ll Only Make It Worse Taleisin - Adventure Machine! While talking to my father on the phone I mentioned that I might buy him a plane ticket from Australia to come and give me a hand - I was only kidding as I would never put him to work against his will. A couple of days later my father calls me up, asking when Taleisin is coming out of the water as he’s coming over and give me a hand. Great I’ll have extra hands to do more work. Annie’s father was due in New Zealand shortly after and he is always keen to lend a hand with anything that resembles work. There’s a lot to be said for the older generation’s willingness to work, no matter how soul destroying or miserable it might be. So I started to make a list (oh how naive I was in my younger days). Mum and dad arrived the day before haul out. Annie was away on school camp for a few days so I was holding down the fort - well as much as can be expected when people are foolish enough to leave me in charge. 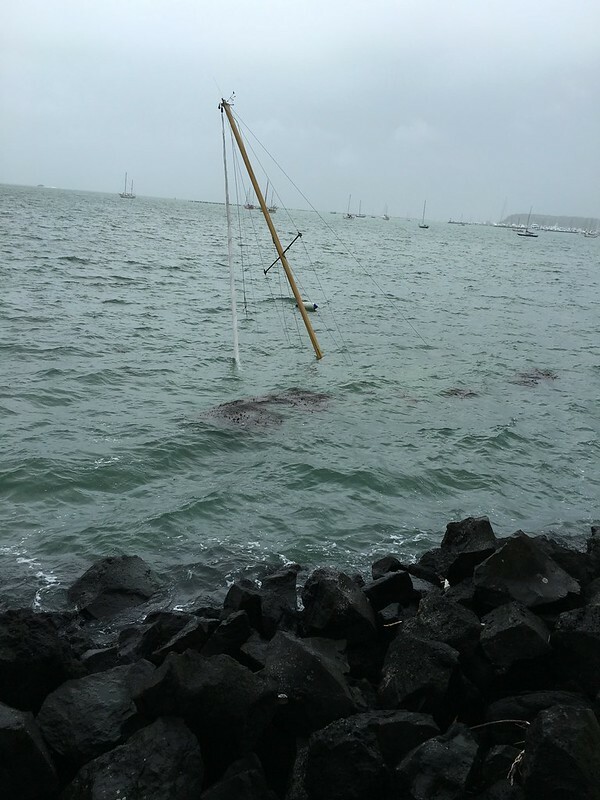 In my infinite wisdom I ended up booking the haul out during the biggest classic boat regatta in Auckland - Taleisin should have been part of it. Never mind, it’s booked people are coming to help so I’m locked in. We’ll be back in the water before long, 2 long weekends should be more than enough and with many hands to help it will go quick! Haul out was much less adventurous than I imagined it to be. We simply walked Taleisin into the cradle and had a couple of attempts to get her seated properly. I probably drove the guys in the boat yard nuts as I was concerned at every step of the process. Who wouldn’t be, a boat like Taleisin in irreplaceable. A big thank you to the crew in the boat yard for putting up with me! Once Taleisin came out of the water my parents thought I was silly for wanting to haul her and paint the hull, “There’s nothing wrong with it, it looks good”. Then came the mandatory water blasting, again I was very explicit in my instructions, keep the lance far away from the hull, I don’t want any damage from water blasting! While the water blasting process was taking place we could see the anti fouling just flaking off. 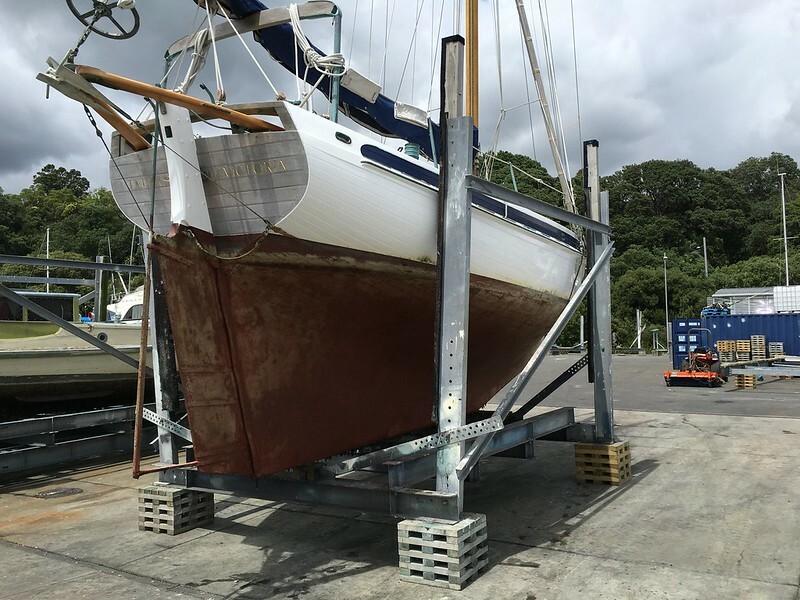 I’ll be the first to admit that I thought we’d just be fairing in a few bits here and there and then painting over the top to get her back in the water with a nice smooth bottom quickly. We went off to the store to get some supplies to get the sanding started. That’s when the first signs of woes to come started to appear. Touching the anti fouling in some places caused it to flake off, hosing it down with tap pressure only did the same. Other areas it was stuck. We had to hand sand as they only allowed wet sanding in the yard. It became soul destroying very quickly and there was no visible progress at all. When you get something that looks like it might be faired in some paint would flake off and you start again. 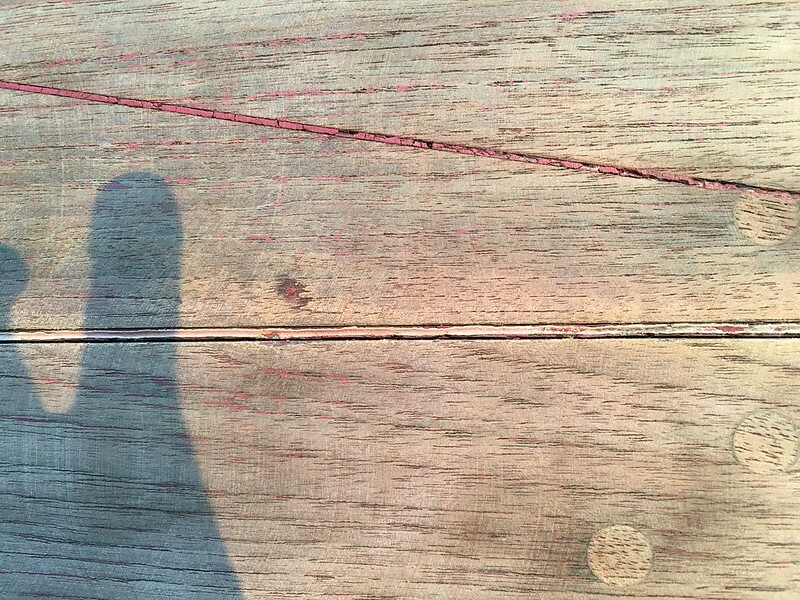 Poking and anything makes it worse, sanding in other places makes it worse. This is soul destroying work. It wasn’t long before I realised that we have to go all the way down to bare teak. This was not the plan! This job is much much bigger than anticipated. So much for the list, now it’s just a matter of getting this one task completed. Taleisin might only be twenty nine and a half feet long, but she’s a HUGE boat. 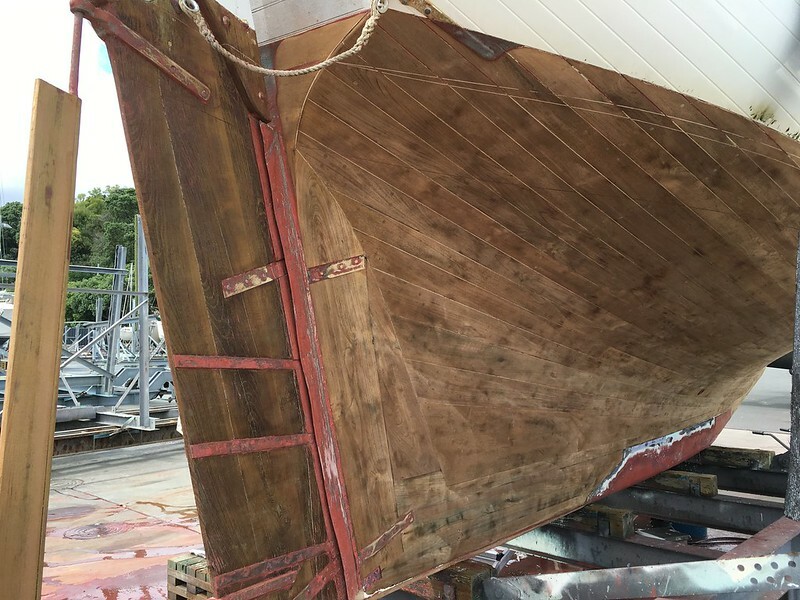 At this point I started to make some phone calls to see how much it might cost to get a professional to come and do the job, most refused to touch wooden boats. There was only one man for the job, Alan Boyd from x-foul-e-8. The only problem was that Alan was busy and couldn’t come and do the job. Alan was kind enough to come out to Taleisin and provide very good advice. 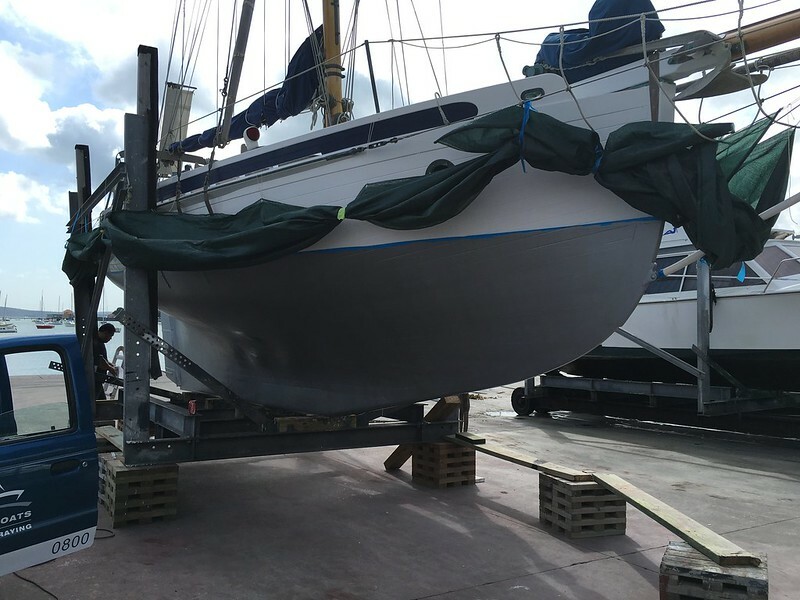 After Alan advised us on how to proceed we had scrapers to remove the antifouling. Progress was being made, but it was still really slow going. We scraped for 4 days, over the long weekend. Nobody in their right mind would find this even remotely enjoyable. This is really the dark side of boat ownership. 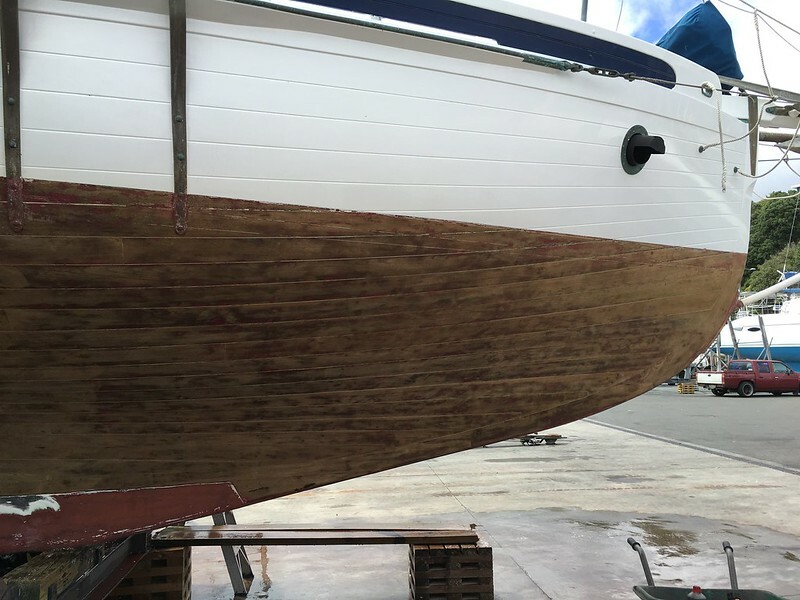 I believe it should be mandatory for any would be owner to clean the bottom of the boat he intends to buy first, if you’re still wanting the boat after that you’re good. It would be interesting to see how many people would still go ahead and buy the boat after that. The hard part was telling my dad that I’m getting someone else to come and finish the job, my dad is one of those people who refuses to pay someone to do a job he can do himself. I felt guilty having put him to work for 4 days of soul destroying work only to get someone else to finish it up. Thanks Dad for all the hard work, I really do appreciate it, I still feel bad for letting you work that hard only to end up getting someone else to finish the job! In my defence the work was actually far from over, it would have taken us a long time to finish it up. After a few phone calls back and forth I finally managed to get a day that Alan could come and do the work. Suffice to say Alan made it look like it was a walk in the park compared to what we went through. The result was awesome. This did mean that Taleisin was sitting on the hard over the second long weekend with nothing being done too her. I do believe everybody deserved the break though, the job was horrible and the pay was even worse! The next step was to get painting done. Having learnt my lesson on the paint removal part (also I’ll admit reluctantly that Annie was the sensible one, yet again)… I enlisted the help of professionals for this. They promised me they would start within a day or 2 of Alan finishing his job. This was important as it was during the hottest part of the year (yes lessons have been learnt). Taleisin was starting to dry out and she needed some paint on her bottom. Naturally, as with anything that involves a boat, things take longer than expected. To those well versed in the drill this will come as no surprise, yet somehow I’m surprised every time! The company doing the painting couldn’t start until the following week. While waiting on the painting to start I noticed that the seams are opening. 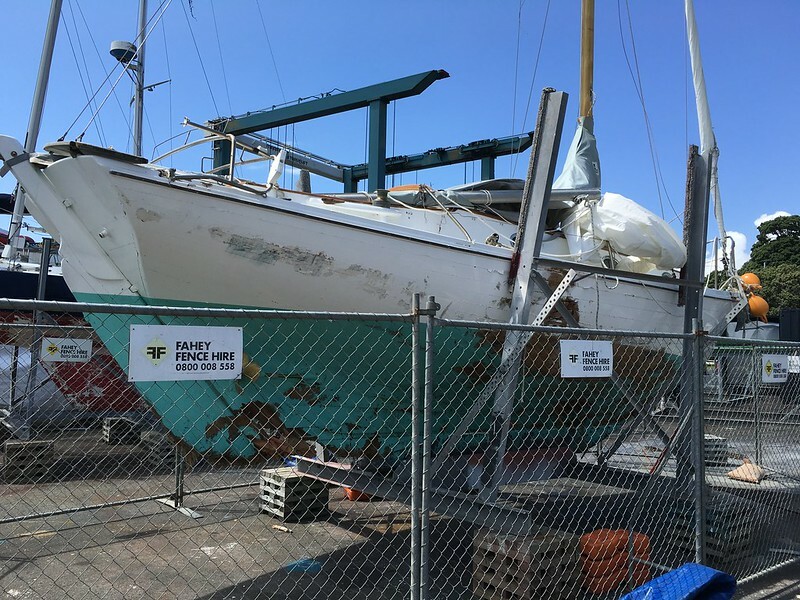 This is not good news for a wooden boat. At this point I stopped reading online forums, every man and his dog was reporting on my progress on the forums here and here. I hit a bit of a panic and of course knowing that the internet is watching I figured I had to do something and quick. I think this was quite an unexpected evening for most of my friends and family, it was a great relief to have such wonderful friends and family! Most people had a lot of fun, sure it was hard work. It’s not everyday you get to be part of something this crazy though (and when I do crazy, it’s usually on a fairly decent scale)! The bucket brigade was a huge success, albeit a little redundant. 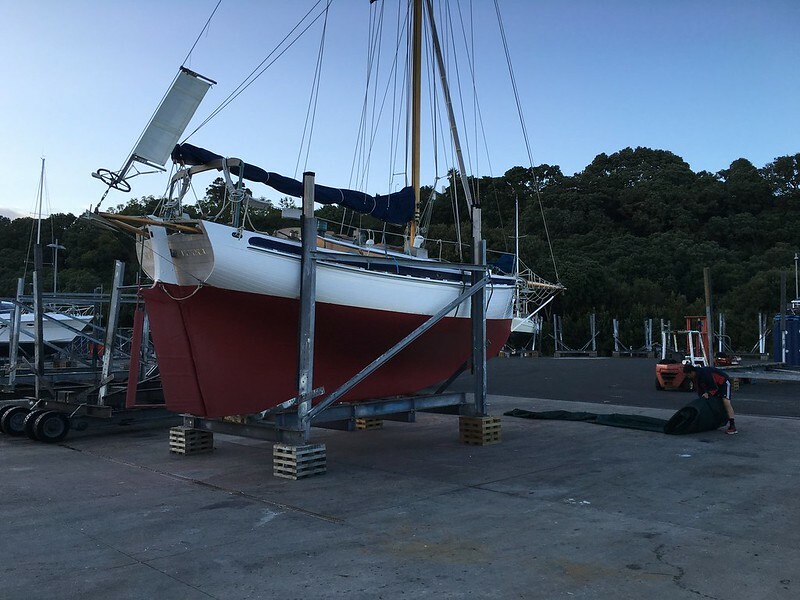 The next day I drove all over Auckland talking and meeting with boat builders. It turns out that since Taleisin has been in the water for so long, a hose would have done the trick just fine as there’s plenty of salt in the wood. The boat builder had a chuckle and said, “don’t lose any sleep over it”. Lessons learnt, but when you hit a panic you solve a problem with the tools you have at your disposal. A very special thank you to everybody that answered the call that night, it is very much appreciated! After some panic, running around, getting advice, hiding, and other shenanigans. I finally get around to doing what I should have done in the first place. I bought a lot of shade cloth and hung it around Taleisin. This made a huge difference. After about 3 weeks on the hard the painting finally got underway. After the primer went on I breathed a sigh of relief! The guys painting Taleisin was great and got a coat of paint on before the 3 weekend started, this made me sleep quite a bit better. As with the guys in the boat yard, these guys had to put up with a lot from me. A big thank you to the team at Gloss boats. Next it was a coat of blue anti foul. 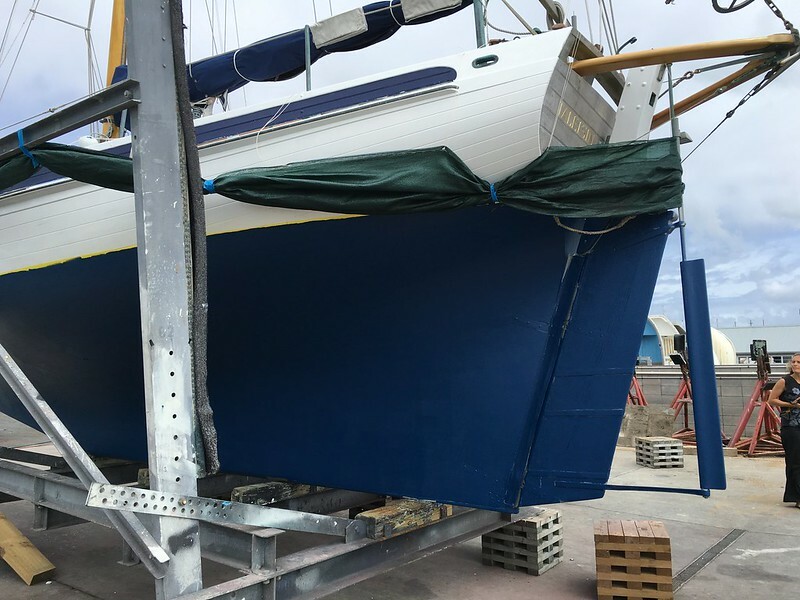 The theory is that when we start to see blue on the hull Taleisin is due for a few coats of paint rather than just one coat annually. Time will tell if this is a sound theory or not. Naturally this is followed by two coats in her natural colour. After the painting was completed there was one more challenge, a huge storm rolled in. This was a pretty nasty one and a few boats ended on the rocks in the mooring area where we keep Taleisin. 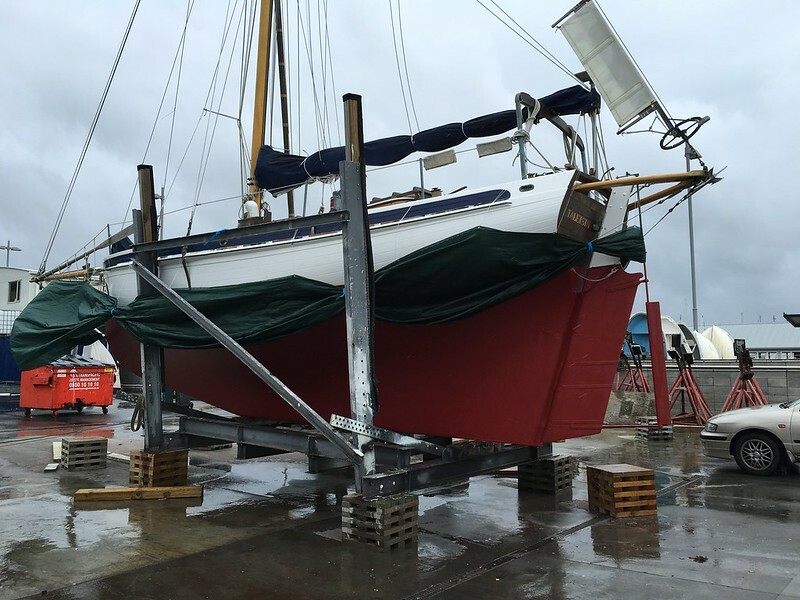 After what can only be described as a nightmare of 4 weeks long, we were finally getting the old girl back in the water. A few days after I had finally got the nerve to give Lin a call, I told her the story. Lin had a chuckle and said: “Taleisin is a tough old boat”, what I should have done was given Lin a call from the start and save myself a lot of worrying. It’s how ever very easy to be reasonable after the fact, hind sight is always 20/20. 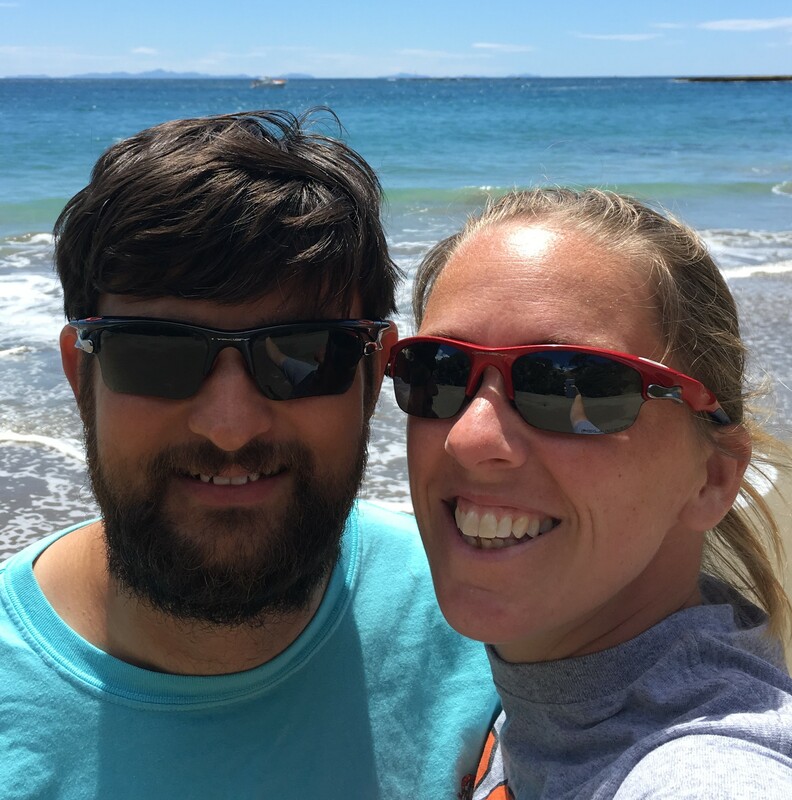 It’s taken me quite a while to write about this ordeal, it’s not always easy to face up to your short comings and admit that things weren’t always perfect. This story did have a happy ending, but I can assure you that it was a fairly stressful time for me. I have to admit that the internet was rather kind to me, it could have been so much worse! Thank you to everybody who stopped by an offered support and thank you to all those who got roped into helping with something at some point during this adventure.